What’s Clacking: Wooting gaming keyboard, GMK RGB modifiers , and more! Fellow keyboard blogger RoastPotatoes has posted an interview with the highly controversial K3KC. From a writing and reporting perspective RoastPotatoes did a fantastic job of asking all the right questions and shedding some light on the “artisan” most know for his blatant copies of other famous caps, like Clacks. RoastPotatoes will be featured as a guest writer in the Artisan Series that is currently just getting started. 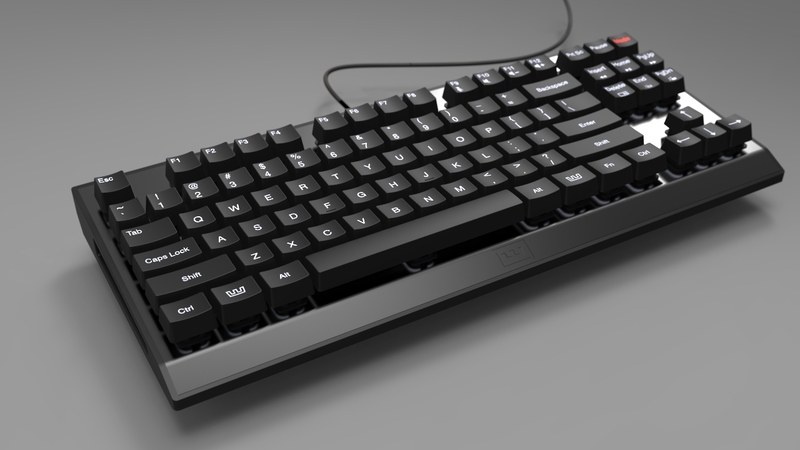 Wooting Keyboard have revealed 3D renders of their new keyboard, aimed to be a good balance between “gaming and fun” for use in home and professional settings when needed. Without more details it is very hard to tell if this keyboard will be able to set itself apart from the competition. It looks very much like a Corsair keyboard, but lacks a lot of the “frills” like backlighting and media keys. Corsair also has exclusive rights to the new Cherry MX Silent switch. All has not been revealed about the Wooting keyboard yet, so further updated information may help set this keyboard apart from the competition in the exceptionally competitive gaming market. Hopefully the red “Mode” button has some tricks up its sleeve. A group buy for GMK RGB modifiers is running until August 17th on GeekHack. With all the GMK sets coming out this is a perfect time to jump in and get some alternate color modifiers. These would look exceptionally good with the Classic Beige group buy that is currently open until September 13th. Andy, where do you come down on the K3KC drama? Personally, I do not support K3KC at all. I think copying others artistic work is morally wrong, regardless of what can legally be done or not. An an artist in other areas of my life, it would drive me nuts to be on the receiving end of what this guy is doing to the original creators of the caps he sells. As mentioned in my introduction to the Artisan Series that will be starting up here, I didn’t even want to mention/link him as I don’t want to send anyone his way at all. I think RP did a great job with the article though, and really just stuck to reporting and asking the right questions which was great.